Sending a Christmas Card by Caspari is a time-honored tradition and when your cards are personalized it elevates that tradition into something really special. 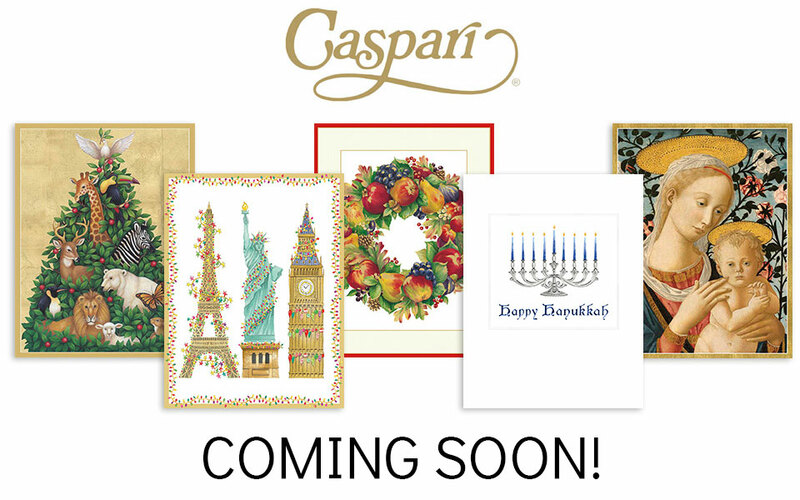 Easy to order and beautiful to send, spread your holiday joy with a personalized Caspari holiday card. Personalized Caspari Christmas cards will add a special touch to your holiday celebration this year. Printed in Switzerland using the highest quality paper and attention-to-detail printing techniques, these cards are a lasting tradition in many holiday homes. The company continues to work with the same European printers and suppliers who originally collaborated with H. George Caspari back many years ago. Caspari cards are exquisitely designed and printed and have a quality reputation earned over the past sixty years. They feature artwork from around the globe and include gorgeous winter-inspired landscapes, holiday botanicals, classic nativity scenes and more. The Stationery Studio has teamed up with Caspari to offer its wonderful products with your personalization. Your Christmas cards will create a sense of style that you will be proud to send. These are the perfect Christmas cards to send from a family, an individual, a couple or as a holiday card from a business. No photo is necessary as these are non-photo works of art. We will print your names or business name on the inside under your choice of sentiment. Find your favorite before it's gone for the season. And, enhance your entertaining this season with personalized Caspari napkins. They are perfect for all your seasonal celebrations and will create a sophisticated flair.